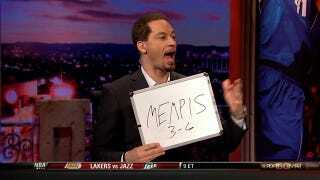 Perpetual late-comer Chris Broussard hasn't had a good evening with his "sources." Earlier this evening, he was comically slow on the news that Deron Williams had re-upped with the Brooklyn Nets to the tune of five years and $100 million. How did we know Williams had agreed to stay with the Nets? Williams tweeted it himself. "After visiting the Suns, the impression the organization made on me was incredible," Gordon said in a prepared statement. "Mr. Sarver, Lon Babby, Lance Blanks, the front office staff and Coach Gentry run a first-class organization, and I strongly feel they are the right franchise for me. Phoenix is just where my heart is now." If you're looking to Chris Broussard for your "breaking" NBA news, you might as well look elsewhere.